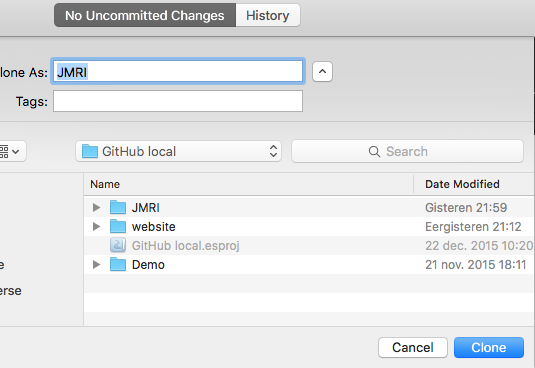 This is a list of Frequently Asked Questions for Git, particularly regarding how we use it with JMRI. Click on a question to open the answer. There's a separate JMRI Help page on how to get the code with Git. See also the Technical index for more information on maintaining JMRI code. Git is free software. Depending on your computer type and your preferences, there are several ways to install it. There's more info in the Git community's Getting Started guide. Get it from the Git download page. It comes with the GitHub Desktop application, available from the Git desktop download page (OS X and Windows only). On the Mac, it's included when you install Xcode. On Linux you can use your package installer, e.g. sudo yum install git or sudo apt-get install git. That horizontal arrow is the "Pull Request" (and subsequent pull) that records information about how things get into the repository. The arrows are both operations (push, pull) and also definitions of where to look e.g. a URL. Git can store shorthand for a URL, called a "remote". The default remote is called "origin". You can have many remotes defined. This says that, by default, fetches and pulls come from the main JMRI/JMRI repository. When you push, on the other hand, it goes to your own repository. 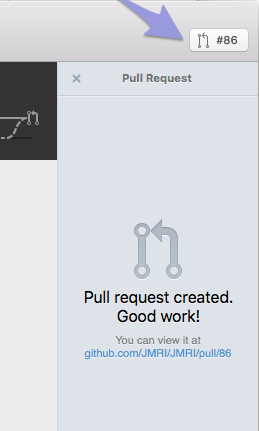 press the green compare icon , then click on Create Pull Request. With SVN and CVS, you check out a "working directory" to make your changes in, work in it for a while, and eventually commit all your changes back to the main repository. Git works on a different idea. Instead of multiple working directories, you have a single repository that's been "cloned" from the main repository. If you're making individual little changes, you can work directly on the default "master" branch within it. If not, see Using Branches, below. When you clone a git repo, you are creating a directory structure that holds all of these items. Unless you tell it otherwise, the working tree starts off filled with contents of the master branch of the repo you cloned - and the staging area is empty. As you make changes to the files in the working tree, you need to explicitly add them to the staging area. Git knows about these files, but they aren't yet officially part of your local repo. Once you have populated the staging area with of all the things you have changed, a commit operation will, uhm, officially commit your changes to your repo's .git/ structure. 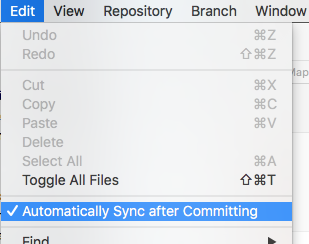 When you pull or push, you are telling Git to synchronize your .git/ content with that of the remote repo you originally cloned things from. Log in to GitHub and clone your own copy of the main JMRI repo. This will give you a safe place to push and pull from without impacting others. $ git commit -m "Merged master fixed conflict"
Make your changes locally, test them, etc. When you've worked on something in GhDt for a week or more, other people definitely have worked on other parts of JMRI. To integrate these new data into your copy, click the Update from JMRI/master button in the top left of the pane (or choose "Pull" from the "Repository" menu). To make your changes available to the community click "Pull Request" (top right button), enter a title and click "Create". Normally, a PR is meant for the master branch of the _original_ repo, say JMRI:master. You may pull your PR in your own remote repo, but only a couple of people, the maintainers, can pull your edits into the "real" JMRI:master. Before they do that, they study what you've written, maybe even pull it into their own repo to test it before merging it for every other JMRI user to see. When your PR is pulled & merged & closed, the PR #123 name will disappear and you may delete the branch safely. The figure to the right shows a couple examples of how we use branches in Git. The black line going from left to right is the "master" branch. Each dot on it is a change that somebody made on the master branch. At the left, the blue rectangle shows how a change can be made. And then, through the PR process, that was merged back onto the master branch (rightmost black dot). That basic process is used to make all the changes to the master branch, although for simplicity we haven't shown all the details for all of them. Sometimes, your development work can take a while. Maybe you do it in several phases, making multiple commits. Before you're finally ready to merge it back into the common code with via a Pull Request (PR), somebody else can make a change on the master branch. The green path shows that case. The branch was created, development took some time, and then a change was made to master (black dot on black line) before the green change was merged back. The merge process in the green arrowhead took care of this. Generally, this is straightforward, because most of the code doesn't change very often: If just a couple changes have been made, they rarely overlap. This motivates our "merge often" philosophy. Sometimes development goes on for such a long time that people made changes to master that matter to you. Perhaps they're new features or bug fixes that you'd like to have in your own development branch. Or perhaps they're changes that conflict, and you'd like to resolve those conflicts in your own work now, rather than waiting for later. The 2nd diagram to the right has an example of this. After the programmer created the blue branch for his own work, changes were made on both his branch (first three dots on blue line) and on master (three dots on black line). 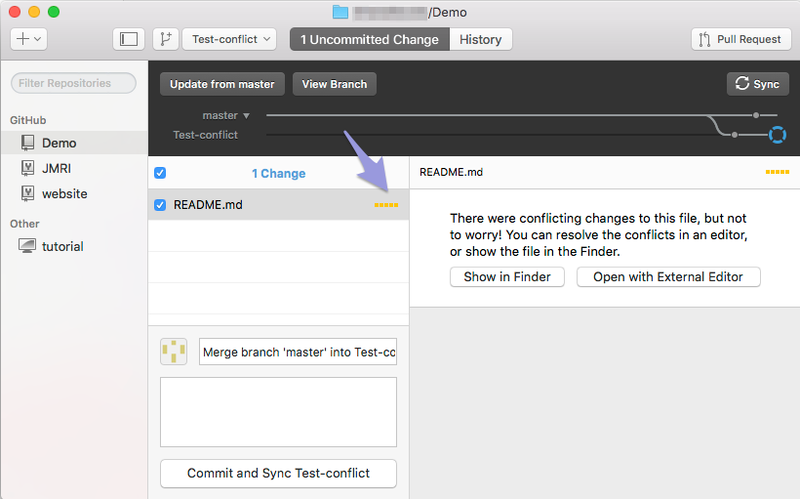 Sometime after that 3rd change on master, the developer decided to "git merge master" onto his branch, bringing all those changes in via the black diagonal arrow. Both his changes and the changes to master are now present in the blue branch he's working on. Later, he decides to merge his work back onto master via the blue arrow in the middle. But at that point, he can still continue to work on his branch (next blue dot). Perhaps he's fixing a bug that was found by a user once the work was merged to master. Or perhaps he's just working more in the same direction. Either way, when he's ready, he can merge again (right-most blue diagonal), or keep working on his branch (blue line running off to right), or merge other people's work to his branch once it's merged (not shown). You get control over when you want to merge in other people work. You can hold off on that as long as you want, even distributing your own version if you want to. 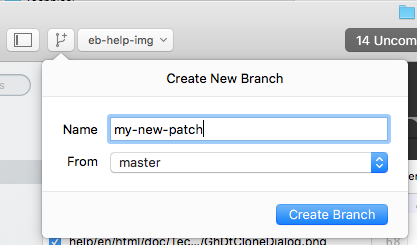 At the same time, you can merge your work into the master branch shared by others whenever it's ready, without disrupting your own work: Your branch is unchanged by merging it with master. More complicated diagrams are possible, with branches from branches to work collaboratively, etc. You can see JMRI's entire branch graph on the GitHub site. The basic idea is important: By working on a branch in your repository, your work can be kept a part of the overall JMRI effort instead of being isolated and unavailable. Always work on a named branch, never on the one named "master". 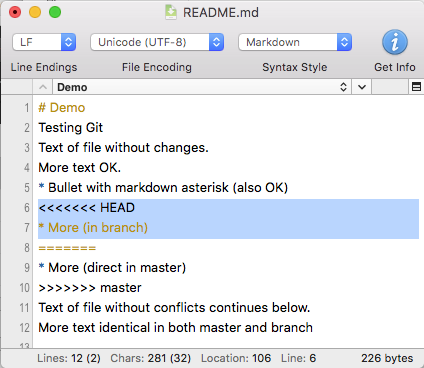 Though you can work directly on the default "master" branch, good "Git Hygiene" encourages you to create a feature branch so you can work on it and never mess up your local copy of JMRI:master. Branches in Git are easy and cheap to create and use; you can have multiple branches at the same time, and switch between them as you work on different projects. We recommend that you name branches starting with your GitHub account name or initials (for example, "abc") and something that suggests what you are working on: "abc-decoder-xml-change", "abc-2015-09-14", "abc-next-cool-thing", and "abc-patch-NNNN" are all fine. That way, we know it's you, and you can sort out the rest. Keep the name short & simple enough to easily type (because people will sometimes have to), and limit it to letters, numbers and use the "-" instead of spaces; that'll make it easier to work with. To delete a branch, select it in the "Show Branches" pop-up menu, and then select Delete "my-patch" from the Branch menu. You can't do that with the master branch, so don't work in that, always work in a named branch. You can opt to create and delete branches in Github web just as easily. More help on Github Web Branching. One of the advantages of Git branches is that it's easy for people to share them. This lets one person work with something that another has done, including editing and improving it, without it having to be released to everybody. Arnie commits it to local repository, and then pushes it to his GitHub repository. git commit -m"Added support for the Frobnab 2000"
Bill can then get that by pulling it from Arnie's repository. where the 1st part of the "remote add" is the URL for Arnie's repository, and you just have to do that command once to define "arnie" as an alias you can use in "git fetch". git commit -m"Fixed a bug in sternerstat handling"
which commits the changes and pushes them up into Bill's repository on Github. Click on that name and choose Show in Finder or Open with External Editor (GhDt itself has no edit tools). Choose which of both versions you wish to keep (or make some combination) and remove the < === > lines! This new proposal should still be Committed to JMRI, so give it a fitting title i.e. 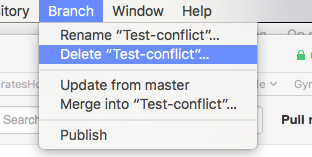 "Solve conflict" and click Commit (and Sync). This extra commit will be added to your PR and be part of your proposal the maintainers will see. You shouldn't keep merge conflict lurking overnight, as the maintainers have no way to fix them for you and they will have to ignore it till you solved it. The main JMRI repositories run a set of tests on every Pull Request (PR). This is called Continuous Integration (CI), and is a time-proven method to keep code quality up. You can add this to your repositor(ies) so that each push will get automatically tested. Travis runs on Linux. It first does a check for wrong line ends (see later section), then runs the complete set of JUnit tests, including testing screen operations. Appveyor runs on Windows. It skips the line end test, as that isn't reliable on Windows. In the interest of time, it also skips some of the XML format tests (Travis is covering those anyway). For Travis, go to the Travis web page and "Sign Up". Use your GitHub account and email. At the end of that process, it will ask you which of your GitHub repositories to monitor; you can select both the "JMRI" and "website" forks. For Appveyor, go to the Appveyor web page and "Sign up for free". Use your GitHub account and email. At the end of that process, it will ask you which of your GitHub repositories to monitor; you can select both the "JMRI" and "website" forks. From then on, pushing to your own repository will run the tests. You'll get an email when the tests are complete, or you can check on the web. 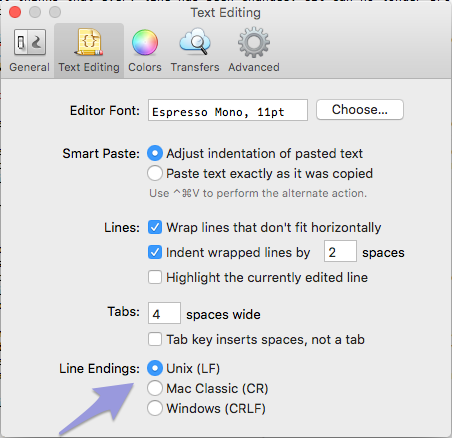 Mac and Linux use a LF character at the end of each line; Windows uses the CRLF pair. 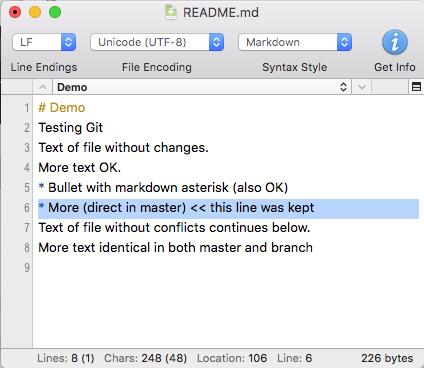 JMRI's text files are, by convention, stored in Git with LF line ends. It's very important that Windows users not accidentally convert a file to CRLF line ends. When that happens, Git thinks that every line has been changed: Git can no longer provide useful, granular history information about earlier changes to the file. There is a ".gitattributes" file that tells (most) command-line Git implementations how to handle this properly. Unfortunately, not all IDEs obey the directives in the file. For example, to get NetBeans on Windows to handle line-ends properly, a specific plugin must be installed. See the NetBeans JMRI page for specifics. If a file with changed line-ends is accidentally committed and forwarded in a pull-request (PR), the bad file in that PR will be detected during the Travis CI test and the PI will not be accepted and merged. Further, the PR will be marked with a "CRLF" label. Since the history has already been lost in this file, the CRLF label reminds the maintainers that it's not sufficient to just change the line-ends back to LF, commit and push: The history has been lost, and more complicated measures must be taken. Abandon the PR and underlying edits, delete the branch, and redo it right. If you're working properly, with your changes in a separate branch, and committing small changes, this is the recommended course of action. Alternately, it's possible to use Git tools to remove the improper commit(s) from the branch. This is much more complicated. Get one of the developers with Git expertise to do it for you, and then send them cookies as a thank-you. Maintainers who encounter an updated PR with the CRLF label should check to see that all the files in the PR do not show all lines changed. If they do, even if they have the correct LF line ends, the PR should not be merged. Many XML Editors have a Preference Setting for line ends. Pull requests are just a special case of a branch. If you want to test them before merging them into master, you can bring them into your local repository and work with them. In some cases, GitHub Web makes specific instructions available right on the pull-request itself. Look near the bottom of the discussion thread, in the last information block. The nice thing about those is that they automatically have the right branch names, etc, included. Please note that, in some cases, these have a "Step 1" for looking at the pull request locally, and a "Step 2" for merging it back. Please do not do that Step 2 request from the command line, but instead use the web interface for doing the actual merge. then compile, test, etc. as you'd like. You can even commit and share changes if you'd like, because this is now your own development branch: It started at the other person's, but it's now your own. If you have a reproducible problem that you think was introduced by a change to the code, "git bisect" can help you track down the commit that caused it. It's very efficient at tracking down repeating problems due to a single change. I.e. set up your branch with the problem, start 'git bisect', tell it the problem is visible here and now, then tell it where there's a good version to search through. Git will sort out the possible revision path(s) where the problem can lie and devise an optimal search. Then it will checkout some place in the middle and tell you "Bisecting: 6 revisions left to test after this" or something like this. and repeat. Git will do a good job of giving you the minimal number of tests to do, and in the end will show you the commit that turned "good" into "bad" - not the PR, the single commit. You can then look at the exact changes in that commit to see what went wrong. Sometimes people contribute files via the SF.net issue tracker or a GitHub Issue. This discussion talks about how to handle those. where NNNN is the patch number. Merge in the changed code as needed. git commit -m"Patch-NNNN plus the patch subject line (author name)"
It's now in your repository on a branch of it's own, where you can sanity test things as usual. Go to your repository on GitHub and start the "pull request" process. 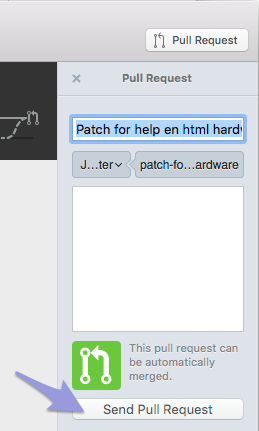 On the second screen, switch the branch being compared in your repository from "master" to "patch-NNNN". Then the rest of the pull request goes as before. 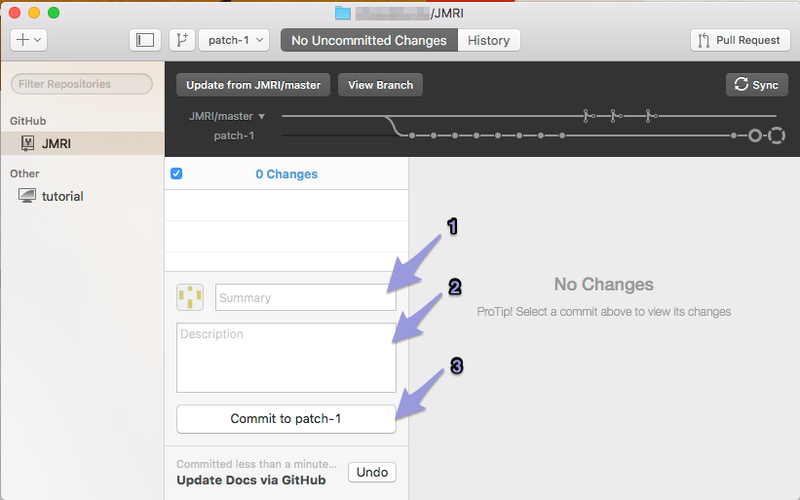 Eventually, a JMRI maintainer will handle the pull request and merge it, which will put the patch changes on the master branch in the repository. The advantage of this approach is that it lets you keep all your own work separate from any patches you're handling. The patches are on different branches than your work, so they don't overlap. "Update" to the HEAD of SVN. You should be doing this routinely anyway, because you'll need to do it before your changes can eventually be submitted. Do this now and solve any problems. Check the status and save the output. Double check that no conflicts are showing. Diff the sources and save the output. This sets your working copy to be exactly the same as the last contents of SVN, the same as the base for the svn diff you took earlier. Copy those files into the corresponding place in your Git checkout. Check the status to get a list of changes. You should see the same list of changed files as the "svn status" you ran earlier. Depending on how much progress has taken place in Git, this might show some conflicts. If so, you have to resolve them here. Now you can start developing, without having lost anything. Registered users with sufficient user priviliges will get a choice of accounts. DO NOT select your own or anybody elses; select "JMRI". Then click the "GitHub" bar again to finish the sign in. Click "Re-build PR" and off it will go. as an additional way of tracking file versions. When we migrated to SVN, we kept those lines in certain files, like decoder XML, properties files, etc, that users are likely to edit and submit back for inclusion.